I think I’ve mentioned the Dekalb Farmer’s Market too much recently…but I can’t stop going there. Recently, I took Gardner’s parents to the market (they came to town for his birthday!) and enjoyed showing them around. You should have seen Ron, Gardner’s dad, running around to each section with the excitement of a little boy. He wanted to see the meat!, the sausages!, the cheese!, the fish!, the live shellfish!, and on and on and on. Gardner sent the three of us to the market with a clear mission: buy fresh fish and veggies for dinner. We looked at all of the options, and decided that the Red Grouper looked the most tasty. Then we saw fresh okra that we couldn’t pass up. Then we found a black and mahogany rice blend that looked interesting. I’m pretty sure if someone went to the store and came home with those ingredients to work with, I’d say, “WHAT am I supposed to do with this? !” Not Gardner. He started concocting all sorts of plans. First, he was going to do a mustard and white wine sauce, but we didn’t have any more mustard. Then, he thought of beurre blanc, but oops! we didn’t have any more lemons. So, he got creative and fashioned this Coriander Beurre Blanc with lime juice and a few other ingredients. 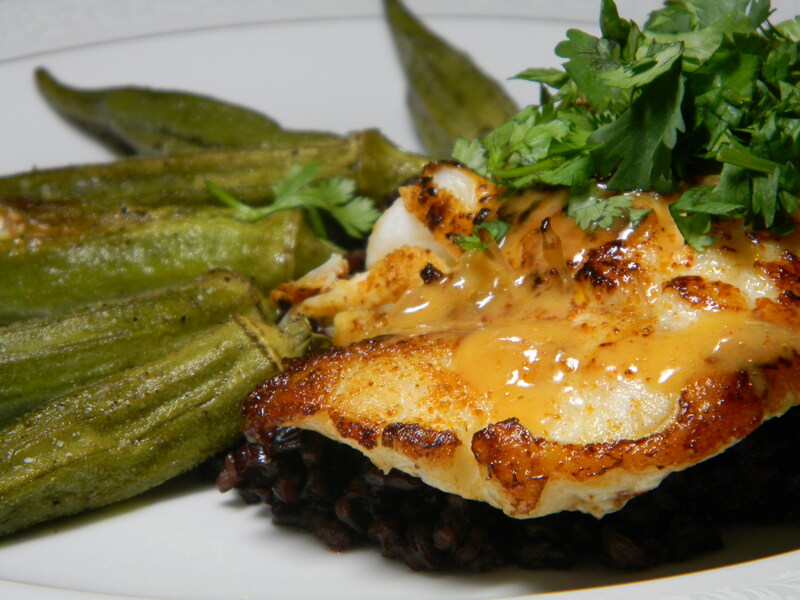 He seasoned the fish with similar ingredients as went into the sauce, topped it off with some cilantro, served the fish over black rice with some roasted okra on the side. We were impressed, so impressed that we practically licked our plates.